Shop My Stuff At Bloggers United 4! Finally! The fourth installment of Bloggers United is here! For those of you not familiar with Bloggers United or BU, it’s a bi-annual event where your favorite local bloggers come together to sell their pre-loved items. It’s like one big blogger party! If you’ve dropped by my booth the previous 3 BU bazaars, you probably already know that I bring my whole house with me every time. This fourth one is no different. I have so much stuff to sell! Shoes, bags, clothes, accessories, gadgets–all at super low prices (as low as P25 for accessories, P60 for clothes and so on and so forth)! For those interested in buying my shoes, my size is US 7. My sister is selling a few of hers too and she’s a US size 5. Actually, out of all the items I’m selling, the shoes are the best. Spiked heels, heel-less shoes, oxfords, pumps–you name them, I have them! So, have I gotten you all excited? 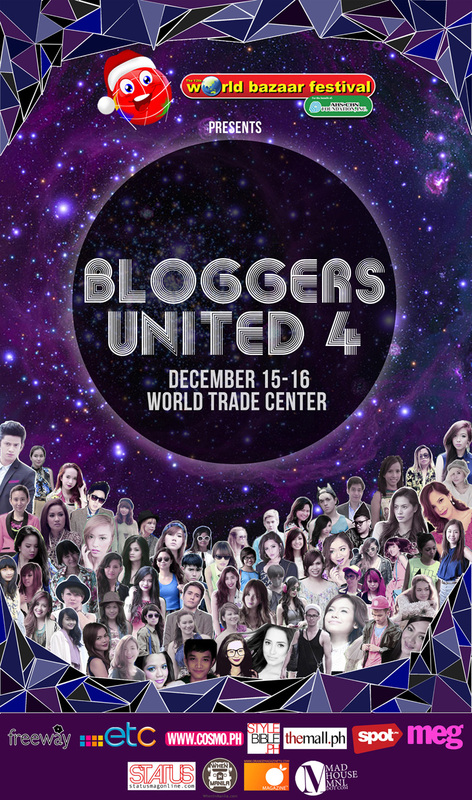 I hope you’ll drop by Bloggers United 4 tomorrow and on Sunday from 10am-12mn at the World Trade Center. Ticket is just P50! I’ll probably be there around late afternoon on Saturday. I’m still unsure of my schedule on Sunday though. Anyway, with or without me there, I assure you it’ll be worth the visit! BU is always worth the visit! This Bloggers United is done in partnership with World Bazaar Festival. Special thanks to BU’s official sponsors & media partners namely Freeway, Giordano, Meister, ETC, Meg, Status Magazine, When in Manila, Spot.ph, TheMall.ph, Candymag.com, Stylebible.ph, Orange Magazine TV and Madhouse Manila. I would like to ask if makeup stores can also participate/get a booth in the bloggers bazzar or strictly for members only? thanks! i will wait for your next bazzar. Shucks I’m so sorry! Napatagal kasi meetings ko :( I went there around 5:30. Next year! Hi Camille, would you know what’s the official blog site of Nicole Anderson? Aww thanks Sarah! :) No problem! Ms. Camille, tapos na po bang event na ito? :) Thanks. My goodness! Grand entrance ka camille yesterday! ang dameng sumalubong! (kasama na ako doon!) mag-isa lang ako. front cam tuloy ng phone ang gamit ko para magpa-picture. hahaha! Haha! Late kasi! :) Thanks for going Honey! On gosh, I’m going to have a look, that’s such a cool idea! I know! Time flew by fast! :) I hope so too! That would be fun! Okay lang yan, you’re in HK naman! :) Shop there! i ve been wanting to join the org and be part of the bazaar. may i know how ms. cam? Okay lang yan! You’re in Germany naman, enjoy! kelan kaya ako makakapunta ng BU…im in leyte kasi ms camille… sana nxt year…maka timing ako…. Now that you have your Iphone 5, you’ll have to let go of all your cute Iphone 4s cases! huhu! Sayang! Are you selling too the sosyal cases like the Marc Jacobs and Tory Burch ones? Grabe lang Divine is participating din diba, tapos i saw a picture she posted in Instagram and i’ve spotted 2 YSL’s and a Louboutin heels in it! I doubt kung bebenta niya nga yun. Siguro nahagip lang ng camera. haha! Anyhow, goodluck to you and to all other bloggers! Awww thanks Krystel! Next time! Can we buy online? Hoping your good stuff will reach Cebuanas! God bless you, Camille! White, blue, gray, cream, gold, so many!